Blackhawk's Sportster line of rifle cases offer quality on par with the highest quality competitors, all while staying affordable. This rifle case, made in the USA, is constructed with heavy duty 600 denier nylon with a PVC laminate for added strength and durability. The over-sized self healing zipper and double rows of locked stitching ensure that the case will be a companion for many years. This Blackhawk Sportster rifle case is designed to fit rifles up to 54" in length and equipped with multiple accessories or a heavy barrel. 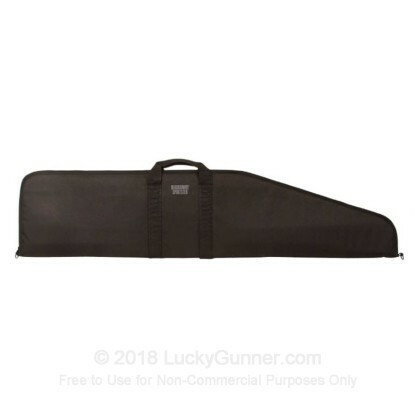 This case measures 55" L x 12.75" H x 2" D.
This is the biggest rifle case I could find and the price was right. I actually use it to carry a target stand and steel target gongs to the range. It protects my equipment without any clanging. I am completely satisfied with the quality of this case and it is very capable of carrying a very heavy load of steel.